COLUMBIA, Mo. – The Institute of Public Policy (IPP) in the Truman School of Public Affairs at the University of Missouri, alongside the MU Office of Disability Services and the Boone County Clerk, is recruiting students with disabilities to serve as poll workers for the upcoming November elections. Emily Johnson, a coordinator at the IPP hopes the initiative helps to insure that people of all backgrounds feel welcome at the polls. The IPP staff will work with the MU Office of Disability Services to recruit students both online and in their office and also recruit students face-to-face during Celebrate Ability Week (Sept. 27th-Oct. 1st). The recruiting movement is funded by a United States Election Assistance Commission (USEAC) grant. Johnson hopes to recruit 15 to 20 students with disabilities to work at the polls for the November elections. She says nearly half that number have already registered. Another aspect of the grant is to educate poll workers without about working with individuals with disabilities and serving voters with disabilities. Matt Buckley, the coordinator for student services in the MU Office of Disability Services, led three training sessions and plans to lead three more leading up to the November elections to address general etiquette as well as effective ways to serve all voters..Buckley hopes the initiative will allow more opportunities locally for people with disabilities. The Institute of Public Policy is a research and public service entity committed to increasing knowledge and understanding of issues facing Missouri state and local governments. It provides policy research to policymakers and conducts program evaluation and other applied research through contracts with public and non-profit entities. 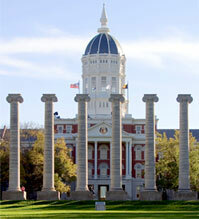 The Institute is a part of the Truman School of Public Affairs at the University of Missouri.